Clanton displayed talent in Auburn’s defensive backfield but also encountered disciplinary problems. He was chosen by the Stallions in the 1984 USFL territorial draft and had an outstanding rookie year, impressing at free safety with his speed and intercepting 10 passes that he returned for a league-leading 249 yards and three touchdowns. Stallions went 13-5 to finish first in the USFL Eastern Conference. Won USFL Quarterfinal playoff over Houston Gamblers (22-20). Lost USFL Semifinal playoff to Baltimore Stars (28-14). Following the demise of the USFL, Clanton joined the Green Bay Packers, who had chosen him in the second round of the 1984 NFL supplemental draft, but due to a failure to come to terms on a contract, it was late in the ’85 season and he appeared in just three games. 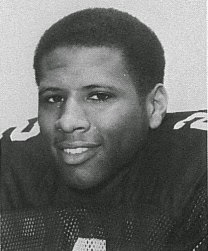 While there were hopes that he would provide depth in the defensive backfield, Clanton was waived during the 1986 preseason and failed to catch on elsewhere. Overall, he intercepted 26 passes that he returned for 524 yards and four touchdowns over the course of two USFL seasons, but that didn't translate into success in the NFL.